It was a new world! New opportunities had come through the setteling of the colonies and The new United States wanted to prove to the world that they were strong, intelligent, and determined as individuals, society, and state. The Republic, Democracy & Architecture, Its leaders believed they would lead the world into progress. From a period of tradition, irrationality, superstition, and tyranny they believed that society would be improved by reason, logic and freedom of religion. Science, study and nationality became important to the developing states. New institutions needed to be established. Government, Banking, universities, trading centers… Architecture was the visual of the philosophy of independence, strength and new traditions. The architecture they chose is called Federalist. The Federal style (or Federalist style) has its roots in England. Even though the war of independence changed the political stage, English influences on architecture continued. Two British brothers named Adam enhanced the square, angular Georgian style of England by adding swags, garlands, urns, and other delicate details inspired by the great temples of ancient Greece and Rome. New America homes and public buildings took on more graceful airs. Americans began to build homes with Palladian windows, circular or elliptical windows, recessed wall arches, and oval-shaped rooms (The most famous federal-style "oval room" is the Oval Office of the White House). This new Federal style became associated with America's evolving national identity. Americans looked to affirm their independence in all domains: politics, economics but also culture, with the foundation of universities and museums. The young America was to be the new Athens, an entryway for democracy. The constitution gave birth to new institutions which necessitated buildings and imposed the principles of national sovereignty and separation of powers. The official, civil and religious architecture reflected this vision and took the Acropolis buildings as a model. The buildings of these new federal and judicial institutions adopted the classic columns, domes and pediments. Whenever the Federalist style is mentioned also is the name of Thomas Jefferson. A man influenced in the Age of Enlightenment, Thomas Jefferson was president of the United States between 1801 and 1809 and had many interests. One of them was architecture. He believed architecture to be an art-form and to be used in service to the New World Democracy. 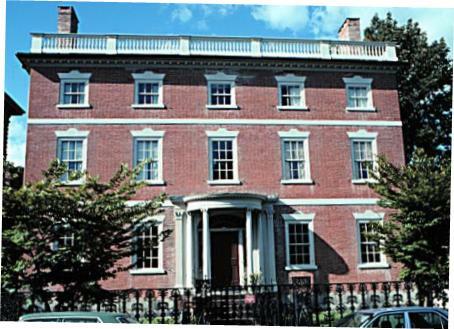 He contributed to the developement of the the Federal style and to adapting European Neoclassical Architecture to republican values born of the American Revolution. Having journeyed several times in Europe, he hoped to apply the formal rules of palladianism and of antiquity in public and private buildings. He contributed to the plans for the University of Virginia Library in 1817. The library is situated under a rotunda covered by a dome which was inspired by the Pantheon of Rome. For the capitol building of Richmond, Virginia Jefferson had seized upon imitating the Maison Carrée in Nimes. It's easy to confuse Federalist architecture with the Georgian Colonial Style. The difference is in the details and adornments. Federal style is a Georgian Style with Adamesque enhancements. 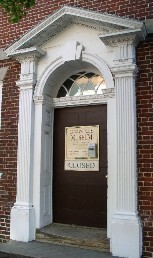 The main identifying feature is typically the fanlight entryway with classical columns and Palladian windows. Georgian homes are square and angular, a Federal style building is more likely to have curved lines and decorative flourishes. Federal style details are often incorporated into modern American homes. The faces of many vinyl clad homes have an extended gabled porch roof supported with columns and the front door with a fanlight above and the elegant arch of Palladian windows to the sides. Characteristics of the Federal style include bright interiors with large windows. The interiors having white walls and ceilings, and a decorative yet restrained appearance that emphasized rational elements. This North American variation on Palladian architecture revived the portico. This interest in Roman elements appealed in a political climate that looked to the Ancient Roman Republic as a model. Architectural publications multiplied: in 1797, A very popular book to influence local carpentry was Benjamin Asher's "The Country Builder's Assistant". .
Up and down the East Coast, Federal-style architecture dates from the late 1700s and coincided with a reawakening of interest in classical Greek and Roman culture. Builders began to add swags, garlands, elliptical windows, and other decorative details to rectangular Georgian houses. The style that emerged resembles Georgian, but is more delicate and more formal. 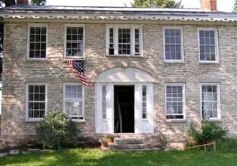 Many Federal-style homes have an arched Palladian window on the second story above the front door. The front door usually has sidelights and a semicircular fanlight. Federal-style homes are often called “Adam” after the English brothers who popularized the style. The Adam style was a refinement of the preceding Georgian style. Although examples can be found elsewhere, the Adam style architecture can be found in all the principal seaports along the Atlantic coast. FEDERAL 1790-1820 Urban style A distinction is made between public buildings and Federal urban dwellings. After America won its independence there was a strong national desire to create a distinctly American identity in architecture. There was a desire for comfort, quality and dignity. The Federal style was especially popular in the South and was far more elaborate than the New England version which tended to be modest. The grand homes in the South were built by wealthy people who hired European architects and considered themselves aristocrats. Usually a rather staightfoward four room, symetrical floor plan the Federal style in the south strived for elegance and refinement. The angular lines of the Georgian style were replaced by curved stairs, oval or elliptical interior shapes and bay windows. Classical columns and detailed moldings created an entrance which announced a grand home occupied by comfortable, refined people. Windows were larger, six over six, and decorated with ornamental lintels. Arches also appear over windows. Roofs were low, surrounded by an elegant balustrade. Chimneys were placed at end walls. In New England however, there was a conscious effort to create a new society of equality for everyone. The wealthy and educated hired local architects and builders. The more modest Federal home is commonly a simple box, two or more rooms deep, with doors and windows arranged in strict styling and clapboard siding. The more elaborate are brick favoring the extended portico with classical columns and balustrade above. In the modest home the stylistic focus is on the main entry -- a paneled door often framed by half or three-quarter length sidelights and thin pilasters or columns. The door often crowned by a fanlight, or entablature. In addition to single family dwellings, attached and detached town houses began to appear. Principal concentrations remain in Boston, Philadelphia, Georgetown in the District of Columbia, and Alexandria, Virginia. Compared to the earlier Georgian houses the Federal houses tend to appear to have a lightness and delicacy. Details tend to be smaller, but structural elements, such as windows and ceilings tend to be larger or higher. The interiors of many houses have decorative or wood or plaster, applied to mantels, walls and ceilings. Decorations often are carried over to the exterior as well, around windows and doors. Paint colors were limited, the most popular being yellow, ochre, or white. Outbuildings and even the nonpublic side of more important buildings often were painted red, the most economical paint color for the period.